The other night Marisa and I hit up Grindhouse Burger Bar with our dates. 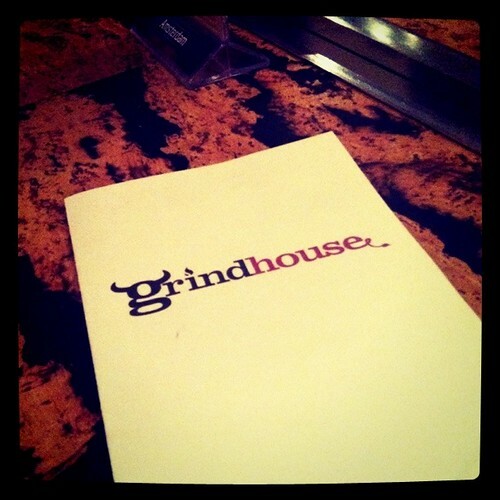 I have been excited to try Grindhouse's food for quite some time now. 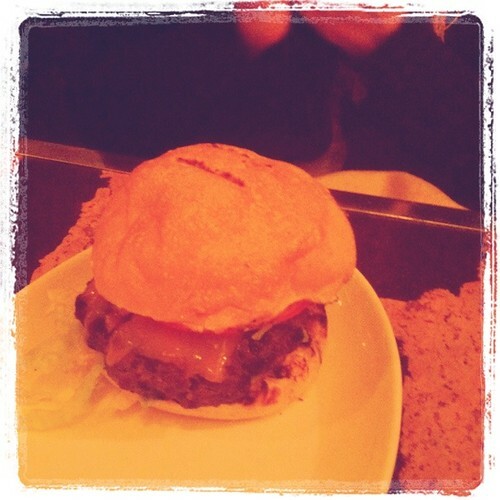 I've admired their long list of burgers and lusted over their menu since I first came across it. I know that they use high quality ingredients, that the food in the restaurant is free or refined sugars and preservatives and that the burger meat is ground on premise and is naturally raised, hormone antibiotic and GMO free. Not only that but they offer gluten free buns as well as vegan and vegetarian options. As someone who suffers from an uncomfortable gluten allergy, knowing I can go have a burger with a bun I can handle is a blessing. Having eaten earlier, I kept it light on date night and tried out a full size of their house salad. This is no iceberg lettuce salad at Grindhouse. 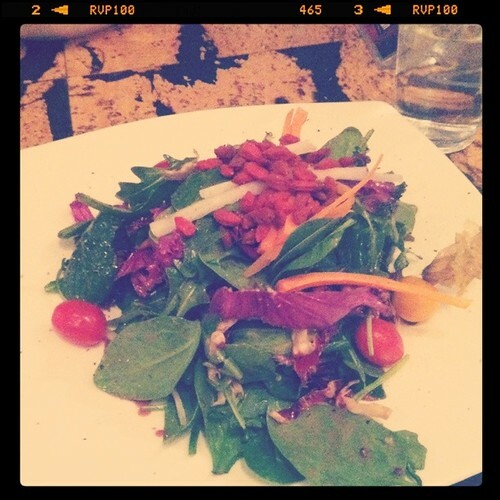 My beautiful fresh Greens had radish, cherry tomato, goji berries, a goose berry and a beet gastrique dressing. It was delicious and filling, other than being a little on the salty side. Unfortunately, the theme of salt continued through the night. Marisa ordered the Signature Beef Burger. It was moist, nicely grilled, and oozing the way a good burger should. Unfortunately, it was so salty that she had trouble enjoying it as much as she would have liked to. Both of the guys ordered The Big Grind, made with their all beef patty, special sauce, lettuce, cheese onion and pickle. The menu states ".....mmm sounds familiar" and the guys were excited for a Big Mac showdown. While the burgers were good and no one complained, they were also a little too far on the salty side. I loved that the burgers came with house aioli and house ketchup. The aioli was pretty good, but unfortunately the ketchup lacked acidity and was more on the side of a marinara. It was probably ten times healthier than store bought ketchup, but it left everybody yearning for some Heinz. 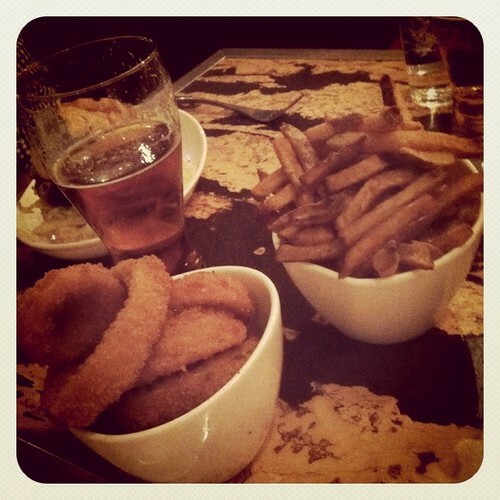 On the side we ordered some fries, poutine and onion rings. All were decent but a little bland and nothing to write home about. I was hoping we would be more blown away by the food, but the burger battle continues. I appreciate Grindhouse Burger Bar's ideals and might be back for another showdown. Food: Decent, a little too salty, but good quality ingredients. 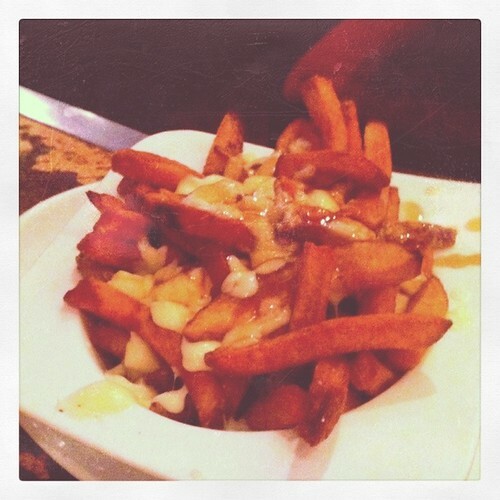 Ambience: A little tightly squeezed in the booths, but comfortable and casual. Price: Average. Big salad for $9, burgers $7-$14. Additional price for local and in house made toppings.